Shirts From Just �12.50 at Moss. Shop Now. Linen Suits From Just �94.00 at Moss. More Matching linen trousers and jackets gives you that stylish lightweight summer suit. Jackets and Blazers From Just �49.00 at Moss. Shop Now. The Moss Bros End of Season Sale!! The Moss Bros End of Season Sale still continues! With FURTHER REDUCTIONS.. Shop Now. Moss Bespoke Was £495 Now Just £295. Moss Bespoke Luxury Cloth & Signature Pack Was £495 Now Just £295 From Moss.co.uk. Shop Now. Clearance Shirts 3 For £25 from Moss.co.uk. Buy Now. No Code Needed. Savoy Tailors Guild 2 Piece Suit Just £129. Plus Get Free Pair of Second Trousers from Moss.co.uk. Buy Now. Men's Dress Suit Just £149. Plus Get Free Shirt and Tie at Moss.co.uk. Buy Now. Chinos 2 For £35 From Moss.co.uk. Shop Now. Ventuno Slim Fit Suit - Plus 2 Free Shirts!! Ventuno Slim Fit Suit - Plus 2 Free Shirts!! Ventuno Suit £109!! Shop Now. French Connection Sale!! French Connection is a fashion-forward brand with a quirky spin on design, offering quality at affordable prices. Shop now at Moss.co.uk. DKNY Sale!! The New York based design driven DKNY range includes suits and polo shirts. Shop now at Moss.co.uk. Sale Casual Wear From £15. Shop now at Moss.co.uk. Sale Coats From £39. Shop now at Moss.co.uk. Sale Shirts From £15 at Moss.co.uk. Shop Now. Before it's gone. Sale Suits From £59 at Moss.co.uk. Shop Now. Farrell Sale – Save Up To 80% Off!! Farrell Sale – Save Up To 80% Off from Moss.co.uk. Shop Now. Big End of Season Sale – Save up to 70% Off!! Further Reductions – Big End of Season Sale – Save up to 70% Off from Moss. Get it now before it's gone. Outlet Shoes - Save Up To £45!! Outlet Shoes - Save Up To £45 at Moss.co.uk. Buy Now. Outlet Trousers - Save Up To £85! Outlet Trousers - Save up to £85! at Moss.co.uk. Shop Now. No Code Needed. Outlet Jacket and Blazers - Save Up To £250! Outlet Jacket and Blazers - Save Up To £250 at Moss.co.uk. Shop Now. No Code Needed. Outlet Suits - Save Up To £550!! Last Chance - When it's gone, it's gone! 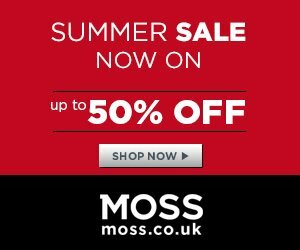 Outlet Suits - Save Up To £550 at Moss.co.uk. Shop Now. No Code Needed. Outlet Last Chance to Buy - Up To 75% OFF!! The Moss Bros out let is now live. All last chance to buy stock and old season stock is within this category. Save Up to 75% OFF. Shop Now. No Code Needed. Savoy Taylors Guild Pack Offer! Savoy Taylors Guild Pack Offer! Regular fit Savoy Taylors Guild Suit + Free Second Trouser Now £149.00 & Save £100. Shop Now. 3 Dehavilland Men's Shirts For £50 or 5 For £75!! 3 Dehavilland Men's Shirts For £50 or 5 For £75!! Offer valid on Dehavilland brand only. Shop Now. Back To College Essentials - Slim Fit Suit £129!! Back To College Essentials - Slim Fit Suit £129 Plus 2 Free Shirts and Get an Extra Pair of Trousers. Shop Now. New Season Men's Coats For £59!! Wrap Up...Its Getting Colder - New Season Men's Coats For £59!! Shop Now. Save an Extra 10% Off Discount!! Save an Extra 10% Off Discount Code & Use Coupon Code: NEWC10 during checkout. Valid for new customers only, minimum spend £100. Moss Bros have been synonymous with quality and value in fine suits and clothing for men for well over a century. The Group's unparalleled reputation in formal menswear and unrivalled commitment to customer service sets it apart in a world that demands only the best. A distinguished heritage is the cornerstone of Moss Bros suits for men, a dynamic and forward looking organisation which spans internationally renowned suit and menswear designers. Passion for style, unrivalled expertise and a proud heritage that spans over a century: Moss Bros is the UK’s most famous name in men’s clothing.